Our hospital and institutional problems are formidable, but not unprecedented: Finding lessons (and validation) in the past. Mr. McCullough’s wise words can also serve as a reminder that the various challenges we find so troublesome today almost always have parallels in the past. Learning how previous generations dealt with the dilemmas of their time can be instructive, encouraging, and often rather humbling. This became very apparent to me recently as I read a copy of Margaret Angus’ “Kingston General Hospital: A Social and Institutional History” which I came upon while browsing in the book section of a local antique market (actually, while killing time waiting for my wife to complete her browsing). 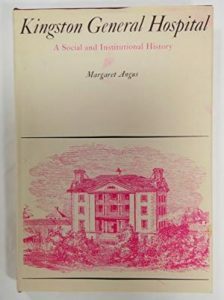 In it, Ms. Angus documents the trials and tribulations faced by those who originally planned, built and operated KGH. Despite the vastly different cultural context and technology, what comes through are accounts of determined and community-minded people coming together to overcome challenges and improve the health care available to their families and fellow citizens. A brief summary of that early history as recorded by Ms. Angus is illuminating. The first petition for the establishment of a public hospital in Kingston came in 1809 from a group of 44 residents and was made to Governor Sir James Craig. Fully nine years later, land for a hospital site was granted by an 1818 Order in Council by the Lieutenant Governor, but no funds were provided for building. A number of public subscription programs resulted in pledges amounting to about £1,000 for the purpose, and led the 11th Parliament of 1832 to finally grant £3,000 for the erection of a Kingston hospital. Drs. James Sampson and Edmund Armstrong were appointed “commissioners for superintending and managing the erection and completion of the said hospital, and for the purchasing or otherwise obtaining, choosing and determining the site thereof”. After much negotiation and consideration, they purchased six acres of a farm lot from Rev. G.O. Stuart between the present-day Barrie Street and Lower University Avenue. Unfortunately, it was far from complete. The interiors had not been completed. It was unpainted, no baths or washrooms, no furnishing and large mounds of excavated earth had been left impeding access to the hospital. The funds provided were practically depleted (although not exceeded). The commissioners went back to government asking for an additional £500 pounds to finish the project. The request was initially denied, but was followed by a more direct petition to the legislature, which, in 1837, eventually provided the funds. By this time, that amount was inadequate due to damage that had occurred in the unused, unheated building. By 1837, a building was in place, but lacked the ongoing support or organizational structure to function as a hospital. However, it didn’t go unused. Over the next several years, it was used intermittently as a military barracks. The first “patients” treated at the site were 20 wounded American soldiers captured in November 1838 at the Battle of the Windmill near Cornwall, two of whom died of their wounds (making our first case mortality rate 10%). In 1840, permission was granted by the Lieutenant Governor to lease the building to the Presbyterian community in Kingston for the housing of a theological college that would eventually become Queen’s University. Dr. Sampson who, in addition to his medical practice and responsibilities as hospital commissioner, was now serving as Mayor of Kingston and negotiated the lease. However, the Queen’s College Trustees, decided to decline the offer, finding the £150 pounds per year cost excessive. The first attempt to develop a working hospital-university partnership therefore failed miserably. By 1841, Kingston had been selected as the site for the capital of the United Provinces of Upper and Lower Canada, and construction on parliament buildings on Ontario Street (currently our city hall) was underway. The hospital building, still empty, was available and selected to serve as the temporary accommodation of the legislature. This decision not only provided a source of income (£300 pounds per year), but also required the completion and expansion of building facilities. The interior was re-configured into two large rooms, for the House of Assembly and Legislative Council, as well as a number of smaller offices and a library. In addition, a number of government buildings and private homes were constructed nearby to accommodate services and officials. 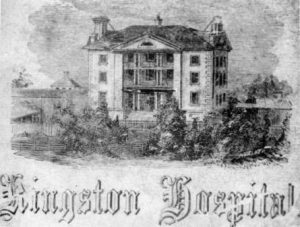 Kingston remained capital only two years, but during that time the economy and population boomed, expanding even further the need for a hospital. By the time the capital was moved to Montreal in 1843, most patient care took place in private homes or boarding houses provided by the Ladies Benevolent Society, and was greatly aided by the arrival of the Religious Hospitalers of Saint Joseph who began to admit patients to their Brock Street facility (eventually Hotel Dieu Hospital) in 1845. And so, the hospital initially conceived and petitioned for 39 years previously, began to admit those in need of medical care under the direction of local physicians and care of volunteer citizens. The problems faced by our hospitals and providers today are certainly daunting, but no more so than those faced by our dedicated predecessors. They needed to make valid cases for resources despite competing societal needs, while simultaneously delivering the best care possible for those in need. Sound familiar? Doing so required ingenuity, patience, perception and the political savvy to take advantage of opportunities that arose, often in times of crisis. It also required forging strong collaborative links to community members and organizations with common values and goals. Forty-six years later, we find ourselves taking tentative steps toward realizing at least a portion of that grand vision. That shouldn’t be seen as an indictment, but rather encouragement that we’re on the right path. Sensible and worthy ideas usually find their way to full realization, not always when we think they should, but when concept and opportunity converge. Examining the past can indeed counter our “hubris of the present”. It provides perspective, illuminates the future and keeps us humble. 4 thoughts on "Our hospital and institutional problems are formidable, but not unprecedented: Finding lessons (and validation) in the past." Great post as always, Dr. Sanfilippo. What you identified as the central issue, “They needed to make valid cases for resources despite competing societal needs, while simultaneously delivering the best care possible for those in need” will continue to challenge us. It’s a never-ending journey. Thanks Amro. It’s a great video. Interesting and enlightening; thank you. Great story. And once, soon thereafter, the medical school at Queen’s was created, in order to accommodate medical students a local lawyer (Sir John A MacDonald – I think a Board member) drafted a new by-law, # 51, which permitted students to see local practitioner’s patients on the wards – for which privilege said students would pay a fee to the hospital. Seems the fees have been going somewhere else!